In his darkest hour Chad le Clos had told the world, ‘don’t judge me when I’m roaring like a lion, judge me when I’ve got my back against the wall’. Never before had the South African been so pinned against the wall as this week. It must have felt like someone had their forearm jammed against his throat, such was manner in which ‘only’ a fourth-place finish in his signature event, the 200m butterfly, had affected him. Especially in the wake of a widely broadcast perceived fallout with Michael Phelps. And at the Olympic aquatic stadium on Friday, the South African responded like the champion he is. It wasn’t gold and it wasn’t bronze, but it was a second silver medal in the 100m butterfly that helped up South Africa’s medals tally to five at these Games. In a finish that the greatest swimmer of all time, Phelps, called ‘wild, really wild,’ Le Clos somehow managed to claw back from what looked for all money might be fourth place with a perfect lunge to the wall. In one of the most remarkable twists seen in Olympic history, the gold medal went to Singapore’s Joseph Schooling, who led from start to finish to win in a commanding 50.39sec. The official scoreboard threw up the names of Phelps (lane two), Le Clos (lane five) and Cesh (lane six) with 51.14 next to them. 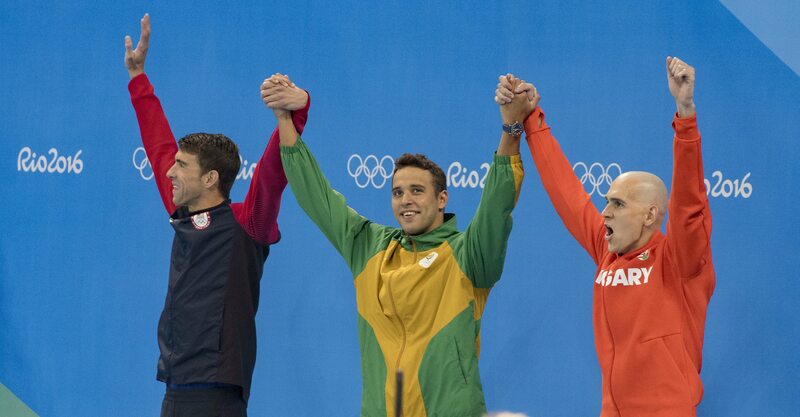 And there it was, gold for the 21-year-old, and silver for three of the most decorated men in 100m butterfly swimming. Le Clos, the silver medallist in the event from London 2012, had got away quickly, but Schooling surfaced and was into his race early, getting his body ahead. At the 50m turn Le Clos had already slipped to fifth, with Cesh fourth and Phelps only sixth. Down the home stretch Schooling had pulled clear, like he had in the semi-final, and it was obvious he was not for catching. Cesh, Phelps and Le Clos were on the charge but it looked like the South African would have to settle for another fourth. The naked eye placed him fourth but at the final touch the scoreboard told a different story. With Le Clos still taking some flak for his perceived taunting of Phelps in the ready room before the 200m butterfly semi-final, the South African had shown enormous heart and character to bounce back on the biggest stage. Afterwards, it felt like a bittersweet moment for him. A silver medal could quite easily have been bronze or fourth and on the night the South African conceded Schooling was too quick. ‘Joseph was a bit far ahead, and then he extended his lead and, I thought “jeez what’s going on here”. My time was slow, but I’m kind of happy. It’s been a difficult week and you know that I expected to come away with a gold. Given the week I’ve had I’m not as disappointed as I would have felt. ‘The 200 fly was a terrible day. It still stings and I can’t pretend I’m too happy, I’m not. It could all have gone pear-shaped for Le Clos after the manner in which he conceded his 200m butterfly crown a few days earlier. Despite insisting that he is in the best shape of his career, he hasn’t looked a dominant force in the water at these Games and ironically the best performance from him came in the 200m freestyle, where he won a ‘surprise’ silver medal. But for him to rebound when things haven’t been going his way shows that even if he isn’t roaring like a lion, he possesses the heart of one. And ‘only’ two silvers from these Games takes his personal tally to one gold and three silvers, for a total of four medals – the most by a South African Olympian. And, on Friday night he showed that it’s not the size of the dog in the fight, but the size of the fight in the dog. Le Clos is ready to fight many more days. There was another dead-heat on the night, but this time for sixth place as Brad Tandy clocked 21.79 in a frenzied men’s 50m freestyle final. The South African had got away well in lane eight and looked a potential Olympic medallist for all of 40m, but in the last 10m he was just out-hurried to the wall by a pack of swimmers and when they touched, the scoreboard showed that 2000 Olympic champion Anthony Ervin, now 35 years old, had won the gold in 21.40. Very proud of you Chad. True olympian. True champion Chad. Well done. You are a legend. Well done Chad so proud of you ,a great swimmer such a humble person. Great going Chad! You make us super proud.